I was a bit lost with that one! I'll even take a Pit ID, or Greyhound... but a LAB? They are like the worlds most common dog. DS's are not exactly common.... and look nothing like a lab.... lol. Tell us about yourself: I live in North Monterey County, CA with my husband, three step kids, one gorgeous and wonderful Dutch Shepherd and a whole bunch of livestock type animals. The humans are into sustainable farming, the dog is into chasing deer and digging up gophers. My day job is an Operations Supervisor at Santa Cruz Regional 911. One of these days, I'm going to get another DS. Chaos gets the wolf question a lot. Every once in a while someone says GSD cross but more often than not, they don't venture a guess and just say, "That's a damn beautiful dog." I don't mind that people don't know what she is, that says to me that that aren't over-bred and are probably still being carefully selected for. And for those who care to know, I'm happy to educate and introduce them to the breed. of course, the dogs pretty much speak for themselves. And if you have ever seen a labrador on the downstroke...well...they you have seen standing ears! But yeah. A bit far fetched to call a DS a lab. Today at the AKC obedience trial a guy came up and asked if Vada was a Shepherd and Boxer mix. We used to get dingo or coyote an awful lot and, occasionally, hyena and wolf. GSD mix is pretty common. 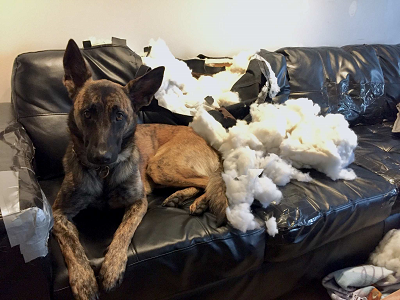 I get excited when someone asks if they're malinois 'cause at least that's closer. One of the receptionists at our vet's office said, "Oh. Dutch Shepherd. Is that a German Shepherd from Holland?" Um, no. I showed her the issue of Dog Fancy which happened to be in the office at the time...the one with the Dutch Shepherd article in it. I have a "A DS is Not" bit on a DS info sign I put up at the NADSR info table. Folks seem to get a kick out if it. Tell us about yourself: I have two wonderful van Neerland Dutch Shepherds and play a little at UKC events. LOL I have had the "hyena" with my bright red brindle girl--she has a very black mask and the stripes make her look a lot like the Striped Hyena. In the local dialect it usually comes out "Hyeenee." My racier girl gets "is that a greyhound?" Plus all of the above...Pit Bull cross, Shepherd cross, Dane cross, Boxer cross, and the occasional "is that a ma..mah..mal...uh..." But mostly just a puzzled "What kind of dog IS that?" I am assuming a "Louisiana dog" is the Catahoula Leopard Dog. Living on the LA border we see a lot of those. They look pretty close to NOTHING like a DS but are an odd color--most are dramatic blue merle and often have blue eyes. Many have a mask. I think folks just see "weird color" and that comes to mind. Plotts are still rather rare in the area though I do have one UKC club member who now has some. Coonhounds of all types are the fashion in my area. PS I still can't figure how to resize my photos--the image will get small but the background (white) stays the same size and counts as part of the total area. I don't have a photo editing program that can do that. I am on dial-up and it takes an hour to upload anything to photobucket, but didn't someone out there say you can resize pictures that way? "I have gone off to find myself. If I get back before I return, keep me here." syzygy wrote: I still can't figure how to resize my photos--the image will get small but the background (white) stays the same size and counts as part of the total area. I don't have a photo editing program that can do that. I am on dial-up and it takes an hour to upload anything to photobucket, but didn't someone out there say you can resize pictures that way? One way to resize the images is to use the built in software that comes with Windows. it is a little different with XP, Vista, and Windows 7...but the concept is the same. I'm going to do it via a Windows 7 system running Office 2010. 1) make a copy of the photo you want to edit ... don't want to mess with the original. 9) look below that and you will see "estimated total size". You will see "original" and "compressed." 10) Choose the radio button for "web pages" and it will compress the image. The limitations on dimensions and size of the image are done so that the Forum members on slower internet connections have a chance of actually viewing the image before the turn of the century. you did punch her though, right? Nah I got excited LOL Not only that it was a fairly educated guess (average person doesn't know what a Malinois is), but she pronounced it correctly!